It was tradition that Tekken and Ridge Racer would open the catalog of every generation, but Namco Bandai has lost this healthy habit. While the arcade speed seems low hours, and after the cancellation of Driftopia -a free to play version of Unbounded-, Tekken seems to maintain its strength. Tekken Tag Tournament 2 was somewhat lower than anticipated commercial expectations, but was well appreciated by fans and critics gather almost every fighter in the series, which are few, and to regain couples not enjoyed since the early mode of this century. With Tekken x Street Fighter moving very slowly - it is not canceled, which is the important point, last summer was announced Tekken 7 for recreation, with planned to debut in March salons date. Not been announced yet domestic versions, but expect to be available for the current generation of consoles and PC quite possibly within months. It uses the Unreal Engine 4 which has no official support from Epic for PlayStation 3 and Xbox 360 under the recommendation to use them UE3 therefore rule out their appearance on these platforms. Curious indeed how technology Epic is becoming a favorite among developers’ struggle. Tekken, Mortal Kombat, Injustice, Guilty Gear and Street Fighter are betting on this engine has diversified genres that fit, and if five years ago was associated with action games in first or third person, now found in a wide variety of products from independent studios and major publishers. The generation gap is noticeable in particle effects, lighting and detail textures. We have also included new slow motion effects in the most spectacular attacks critics and plans for demolition techniques..
As a new main event expected progress on plot and a small staff compared to Tag 2 to return for completely new characters. 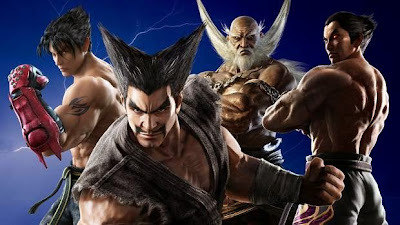 It is said that Tekken 7 will end the Mishima clan and the whole conflict from the first Tekken confronts Heihachi, Kazuya and with its entry into 3- Tekken Jin Kazama. In our article dedicated to the series you can find every episode, in summary, faces Heihachi with his son and grandson in a war that goes beyond a family discussion when they come into play megacorporations with armies or superhuman strength Devil gene. Tekken 7 opt for a darker the last deliveries story. The producer Katsuhiro Harada gave as an example in this respect the seriousness of Tekken 4, the most controversial among fans of Tekken title, that although it took risky decisions gameplay did not like many, was able to give a better context to main argument a story mode where abounded end sequences with dialogue, and not just gags. One of the new faces in history is that of Kazumi, mother of Kazuya and Heihachi wife, killed by him. Although we knew his name by one of the scenarios Tekken 2 -the stage floor Heihachi mentions the couple- and the animated film Tekken: The Motion Picture, which is not part of the canon, so far not much is known of the games. It is important to the plot because it is the first of the family to contact the Devil gene, which is why Jinpachi, Lars Heihachi or lack of it and instead itself is present in Kazuya and Jin. The first trailer shown Kazumi their attempt to stop Heihachi, and if did not achieve so, Kazuya should be responsible. Will Kazumi somehow the final enemy? We don’t know whether it will appear in the game apart from the videos, but it's a Tekken and everything is possible. After all has the same power as Kazuya escaped death after falling into a volcano at the end of Tekken 2, so I doubt it is completely finished; everything is possible. We do not know the full cast of fighters, but a few. Among the classics again, Alisa, Asuka, Bryan, Dragunov, Feng, Hwoarang, King, Law, Leo, Lili, Paul, Steve, Xiayou and members of the Mishima family: Heihachi, Kazuya and Lars. Jin remains to be seen, no doubts that will be present. Among the new we have Shaheen, Saudi wearing clothes that reveal their origin. Harada has been very careful with this design, since Tekken has many fans in that country and is not the first time it receives complaints about an aspect related to the sensitivity of these players-he had to change a texture of soil in one scenario 2- Tag. Lucky Chloe is an inclusion that has been much talk in social networks. His appearance fragile girl who is supposedly not Japanese but this geek culture, mimics a cat with gestures, meows and accessories like the typical ears cosplay. Say rather shocked the West and hence a controversy arose with Twitter Harada apparently reacting badly to criticism and even commenting that would not reach the American version. Everything was a "joke" and will be in all regions. Another new fighters Katarina Alves is vaguely described as Latin America, possibly Brazil-like Eddie and Christie. It is known that it is foul-mouthed during combat and is designed for novice players, so without knowing their martial art, presumably it easy to chain combos, similar to Lili. The Italian Claudio Serafino is the last of the new characters, at least until now. It has been seen in tests of recreational and uses some power in their attacks; in one of the trailers materializes an arc with the gesture of throwing an arrow. Tekken 7 away from fights pairs of Tag and maintains some of the mechanics introduced in recent games. In Tekken Revolution -a free to play for PlayStation 3- collects debouncing during combos, who had upset gamers veterans of the series. Many of the movements that produced this effect which the opponent collided with the ground to jump by Aires also been modified and only have utility to start a chain, but is offset by other movements that allow you to extend combos, not that are reduced. As a new Power Crushers, very offensive techniques running character absorbs shock while medium and high impacts appear. There is therefore a movement for the desperate because the move can backfire. The Rage Arts are the equivalent of Super Street Fighter and running in Rage mode, when the vitality descends from a percentage-. If the user decides to use the attack, you lose the state, meaning you can only use one per round. The Kazuya is a transformation Devil would rule that character as an independent. There are several Rage Arts fighters and can be introduced during combos, multiplying the damage and chance to turn the tide of a battle. Some weapons customization added back attacks, as happened in Tekken Tag 2. 6 and has deepened much on accessories that are available, we expect the characteristic humor of previous games is not lost, where in addition to modify the appearance with many combinations there was always room for typical madness of Tekken. Tekken 7 will use multiple scenarios using soil and break barriers. In addition to the spectacular offering these situations, the boat hits the victim is another way to extend a combo. There seems to be many changes from Tag 2 but have not yet seen and perhaps infinite landscapes are eliminated. One of the latest features disclosed running is quite simple and yet very interesting: to give each player the choice to place your character on the side of the screen of your choice, at least when they are playing in different systems or other recreational -online conectada-. Since it is a 3D game and the scenario is completely recreated 360 is very easy to be the camera who select the profile of our fighter, showing his chest or back. It seems a good idea for beginners who are still learning movements of fighters and still have problems memorizing the longest combos, or press the reverse directions. It may not be very relevant for future domestic versions, but in arcades Tekken 7 brings another novelty, and that allows users to play online against various local, not only between nearby as usual machines. Tekken 7 is ambitious in its history and could be crucial to future sequels. We shall see what will become of these plans, because it is not the first time we talk about something; Tekken 5 was announced the death of Heihachi that came to nothing. We are eager to see the new additions-and try- or combo system. The reaction of the Japanese users with the arcade give us a clue if the changes are satisfactory. This is the first step of Tekken for a good start after the 20th anniversary.